No. 7 Florida Gators baseball (40-15, 19-11 SEC) closed out the 2015 regular season with a series win over the Auburn Tigers. It marked the fourth series in a row in which Florida dropped its opener (4-1), the third straight in which it recovered to win the next two games (4-3, 3-1). UF ultimately finished in fourth place in the league behind LSU (20-8), Vanderbilt (20-10) and Texas A&M (18-10). Nevertheless, the Gators are well-positioned to earn a national seed and host a regional in the 2015 NCAA Tournament due to their high RPI (No. 6), nonconference strength of schedule (No. 13) and recent series win over VU. The Aggies (No. 7 RPI) and Commodores (No. 11 RPI) will both be entering the 2015 SEC Tournament with the goal of jumping Florida in the national seed pecking order. 1. 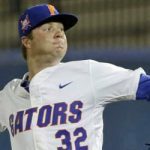 Another tough break: Sophomore right-handed pitcher Logan Shore gave Florida a quality start Thursday night, but his teammates failed to come through with adequate run support in the 3-1 loss. Shore has experienced some ups and downs in his second year, but the combined line from his last two losses (14.0 IP, 8 H, 3 ER, 5 BB, 11 K) demonstrates that a pitcher’s record (6-6 in Shore’s case) does not tell the whole story. 2. Old issues return: Sophomore left-handed hurler A.J. Puk appeared to have finally turned the corner after back-to-back dominant outings against Georgia and Vanderbilt. But against Auburn, he looked like the inefficient, ineffective Puk that Gators fans got to know throughout the season. In the second inning of Friday’s game, a pair of walks snowballed into a three-run frame for the Tigers. Puk was pulled with one out in the fourth inning after 74 pitches. 3. Heating up: By the numbers, sophomore first baseman Peter Alonso underwhelmed in 2015. After missing the first 30 games due to a broken foot, Alonso hit a pedestrian .262 with only two homers over the next 22 games (through the Vanderbilt series). Over the weekend, Alonso showed what he’s capable of doing; he went 4-for-10 with a home run and three RBI. A productive Alonso would be a major boost for UF this the postseason. 4. Slipping, sliding and slumping: Moving down to No. 7 in the batting order did not help junior left fielder Harrison Bader break out of his recent slump. Bader has hit just 4-for-31 at the plate lately, including 1-for-10 over the weekend.. If there’s anywhere he might be able to bust out of his slump, it’s Hoover, Alabama. A year ago, Bader went 10-for-19 with three RBI and earned a spot on the SEC All-Tournament Team. 5. Seniors go out in style: Senior third baseman Josh Tobias hit a two-run homer that scored the go-ahead run in the bottom of the sixth of Saturday’s 3-1 series-finale victory. In the ninth inning, senior left-hander Bobby Poyner was called on to collect the final out and sealed the deal for Florida. Junior RHP Aaron Rhodes, who graduated this semester, also took part in Senior Day festivities, recording UF’s 4-3 win on Friday. Up next: As the No. 4 seed in the SEC Tournament with a first-round bye, Florida’s first game will be Wednesday night at approximately 9:30 p.m. UF will face the winner of No. 5 seed Arkansas and No. 12 seed Tennessee. The Gators won their series with the Volunteers 2-1 but did not play the Razorbacks in the regular season.